Tokenization will foster new economic models for blockchain-based music applications. With the advent of blockchain technology in the music industry, decentralized applications give birth to new economics. 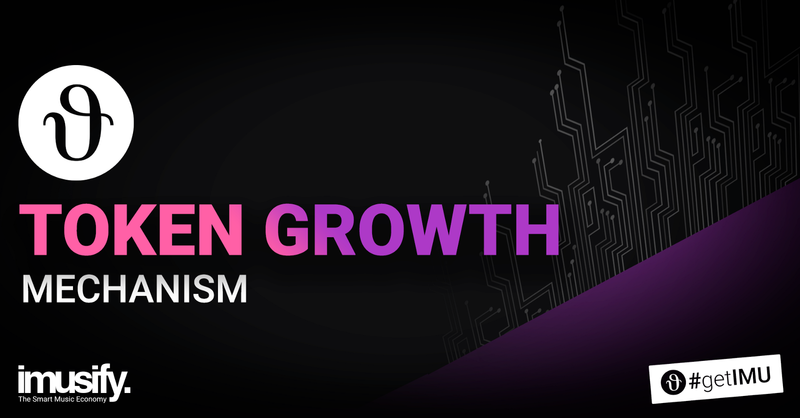 At the heart of such economics resides the concept of Tokenization, and consequently Token growth. Tokenization is the process of digitally assigning a soundtrack — or any digital work — to an asset having value. Like digital money, such tokens can be sold, bought, and transferred to other parties for use in their respective ecosystems. Tokens represent a new form of economy in the blockchain space, a means to transfer value. For the global USD 17 billion music industry, the token growth mechanism is worthwhile studying. Let’s take the example of imusify, and our native cryptocurrency, the IMU. Revamping the music industry globally is one core challenge for imusify. With the expansion of the global streaming music revenues scheduled to be over 12 billion by 2023, prospects of reaching a billion users is now a reality. The number of digital music consumers is expected to grow by 260 million by 2020. To reach such markets, imusify has come up with an award-winning blockchain platform that will serve billion of people in the music industry, from recording artists to fans, ensuring all their needs are met on the platform. IMU Tokens are the native tokens to be used on the imusify ecosystem rooted in a solid business model as explained in the whitepaper in an ever-growing industry, which is the music industry. On imusify, users will be able to perform traditionally unpaid actions in the centralized world such as listening to music, uploading content, sharing music playlists, supporting and voting for artists, and even crowdfunding their projects. IMU Tokens will be served anytime each action is performed on the platform. Plus, thanks to tokenization and smart contracts issuance, artists will finally be able to sell their songs to third-parties, for example, in TV or cinema, and receive fair compensation whenever their songs are played out. imusify has calculated that non-artist revenues i.e. missed revenues due to illegal music downloads and inefficient data copyright management plus inactive payouts in the streaming business, could be approximately USD 43 billion. As stated in the whitepaper, the IMU Tokens are a closed-loop cryptocurrency, acting as a store of value and transaction vehicle within imusify. With a limited supply of 1,000,000,000, IMU is a deflationary currency. Finally, to ensure stability, the value of transactions on imusify will be labeled in USD. As developed above, we can see that imusify meets the three pillars to sustainable growth over time. Upon user’s adoption, we will see how IMU Tokens develop since IMU Tokens serve a global user of music fans.